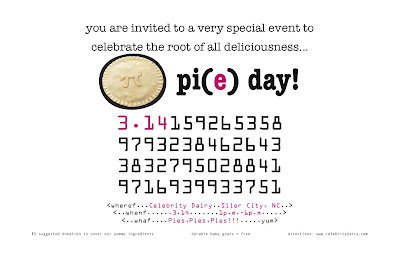 Here's how we plan to celebrate Pi(e) Day 3.14 on the North Carolina Piedmont: A feast of 20-30 homemade sweet and savory pies and homemade goat's milk ice cream at Celebrity Dairy goat farm, a Pi(e) Walk walked in a circle of circumference 2pi(e)(r), live music, baby goats, and outdoor projection of pie-stealing hobo films. I am very excited. What does your pi(e) day have in store?